First post - so hopefully I am directing this to the right group. I am looking for some advice on my log cabin. I attach a picture for comment, but essentially one wall is bowing, with the logs coming away from the window frame. I can push them back in (with some real effort!) but they will not stay in place and the wall bows out again. Any ideas on how to fix this? I've been recommended to screw the individual logs back into place, into the window frame. But my concern is on the seasonal expansion and shrinkage of the cabin and would that approach cause more issues? At a loss! Guys I need your advice! Thanks so much! Apologies - picture now uploaded! The window too close to the corner is the issue. If you remove the window, can you run a board on the inside and anchor it to the top and bottom full log, then anchor the stubs to it? 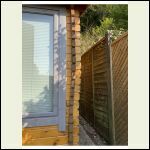 You may have to order a new window as the opening will be smaller. . Other option is to use a long screw, window removed, now anchor the second from the bottom (small stub log) to the bottom full length log, then its solid, then anchor the next one up to it and so on. Anchor them using the toe nail affect, up and down at an angle, this will tie all those small stubs to the top and bottom full length log. Window can still float, this way, you can use same window, first idea would require a little smaller window. 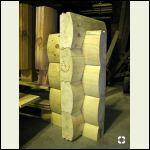 Another option would be to put a 4X4 or even a 6X6 post in the corner on the inside, run it from floor to ceiling, it could be made to look like a support beam, part of the original design, then long timber locks, anchor the logs to the post, do this on the front and side. May have to add post in the other corners to make it look like part of the design vs a patch, ie only in the one corner would look funny. The other ones, you wouldn't need to tie the logs in, just on the side bowing out. Just from looking at the picture, it looks like those are 2x logs? Is that really the wall bowing out, or is it just the siding bowing away from the structure at the end. I have a hard time believe what is bowing out is structural, you just can't stack logs that thin for your actual walls. If it is just siding, some timber locks into the actual wall framing/studs should pull them back in. However, then you will be applying an outward force to the wall which, depending on how sturdy the frame is, may pull your window out of whack a little being as close to the corner as it is like toyota said. The wall appears to be maybe an approximate 3" thick, patterned along the lines of the image I attached below. If that is correct, and IF that window was supplied from the kit supplier then the designer blew it. There is nothing holding that wall in place as toyota_mdt_tech points out. If the window was added at a later date that was a big error. Is it correct to assume this is a part-time residence, not full time? I assume it is part-time as that type of wall is not very energy efficient. If a part-time cabin I would be inclined to use large aluminum or steel angle stock 3/16 to 1/4" thick with 3 to 4 inch legs. Set a vertical length into the outside corner with a 5/8" diameter machine bolt through the upper and lower wall "logs". Hopefully there is at least one continuous length of that grooved wall "timber" above the window. If not that complicates things. I would either use a flat plate, at least 4x4" and 1/4" thick on the inside as a large washer to spread the load or use another angle of steel or aluminum on the inside corner. That would allow the wall to be drawn back into alignment; get rid of the bow. Paint to blend with the color of the wood. Outside you could more or less hide the angle material behind the finger-like pieces that interlock at the corner. Nobody would ever see it. Inside you could attempt to disguise it a bit with stained trim. The thru the wall bolt would be a point of heat loss or gain and would bother me a lot in freezing weather. I can see icicles trying to form inside when very cold. But if this is part-time that could be lived with as the wall thickness has not much more than an R-value of maybe 4 or 5. I think if you try to screw the "logs" to the window frame, the window frame will eventually distort or tear apart as the wall tries to bow outward. I agree with the fix that ICC stated or something along those lines. Really tough to tell from one pic, but is there any header above the window? Doesn't really look like it from the pic. Also how is the roof structure supported there? I have some concerns at least from the pic that you could possibly have more issues? Have anymore pics of it? A friend's small 10 x 10 cabin uses the same "logs" and has shifted into a parallelogram. 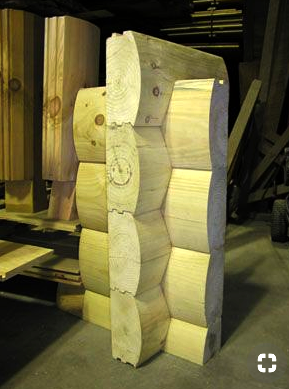 The issue is that the logs laying one ontop of the other are not pinned and therefore slide along the groove. Believe it or not, I can see how the walls are no longer square due to the prevailing winds. I'm sure the door is a bugger to open and close at her place. Yeah my first thought was that maybe putting in the right-hand side of the window frame a big piece of angle-iron might take the load off. But whats holding up the roof? And the under weight the edge of the steel itself could cut into the top header and bottom wall beam unless horizontal plates were put in to spread the load. Could there also be a lot weight bearing down on that window? If so removing the window adds risk. Additionally the glass itself may be liable to breakage or bursting. Also, before adding anything, say the floor to ceiling steel/angle-iron or an inner 4x4 post would it be advisable to crank up a telepost in place as temporary support? On the issue of that window. If there is no header and if there should be a header (when isn’t that the case? ), would welding up a steel frame meet code? Basically 2 heavy angle iron squares. Install one from the outside, the other from the inside and then tie them together with a ring of steel plate lining the inside. Then are there shear forces at play that add risk to the structure? A steel window frame could help tie that outer wall to the main wall to the left of the window. I may be way off, and I know scale is hard to see in that first picture. But it looks like that window is trimmed with just standard 1x4, and the "logs" are no wider than the actual window framing holding the glass. You can also see the top of the 4x4 post for the fence to the right. I just can't see those "logs" even being 3" thick. The logs are at least twice as tall as they are thick. So if they are 3" wide, that would mean they are a minimum of about 5" tall after taking out the T&G. 15 "logs" from the top of window to the bottom, that would be about 6.5' tall window. That would be a big window. And although you can't see the ground it looks to be more than a foot and a half off the ground. In other words, those "logs" seem way to small to be structural, seems like siding. Even ICC's picture you can just see how much beefier those things are. So there should be a solid frame under those. I could very well be wrong, as people build some strange things. I mean, that's the whole reason for building codes after all. But I would be pretty wary staying in cabin made of those popsicle sticks. 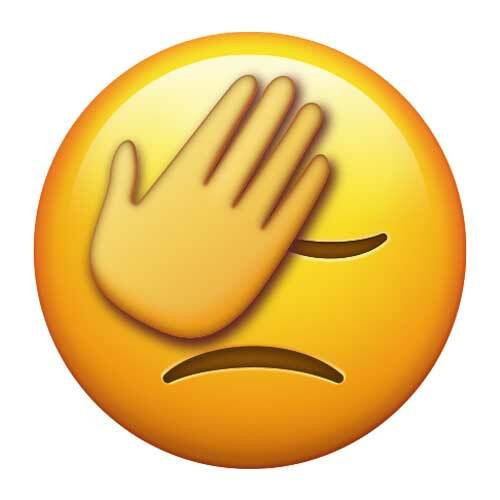 I have to apologize as sometimes I get ahead of myself. Seems like the easiest thing to do would be to find out how the inside of that corner looks. If those logs are actually structural, the inside should be bowing out just as bad. Should be pretty noticeable, especially if it is drywalled, all the seams would be cracked. If the inside is still nice and square, those logs are just for looks and you really only have a problem with your siding. And siding is easy compared to the frame. Framing problem, then guys above have some good ideas. I would guess though since there is only a picture of the outside, only the outside was noticeable. At least I would have also taken a picture if the inside wall of my house was shifted out that far. It would be nice if the OP would come back and comment on the actual construction. I believe the walls are just poor design,a kit type thing, and what we see with the overlapped and notched corners is the actual shell. If that is siding over typical stick framing it would be very strange... very odd and cumbersome way to side a building. The photo I dug up and posted uses a convex exterior which adds to the visual effect. The lumber used in the posted picture of the bowed out wall appears thicker than 1S4S 2Xsomething, but yes, is not 3 inches. You are right, Lippy, more pictures of the inside, the window top portion and so on would go a long ways to coming up with a solution. ICC, I only think it may be siding as I have seen that type here in Michigan in the past. Seemed to be a thing in I think the 80's maybe. I believe when aluminum siding kind of went out of favor people wanted there northern cottages to look like log cabins so they started just putting 2x (or something close) on the outside, a lot cheaper than 1/4 log siding. Not a bad idea for a lot of those old cottages as at least I think it does look better then aluminum, and adds some R-value. A lot more work to upkeep though. 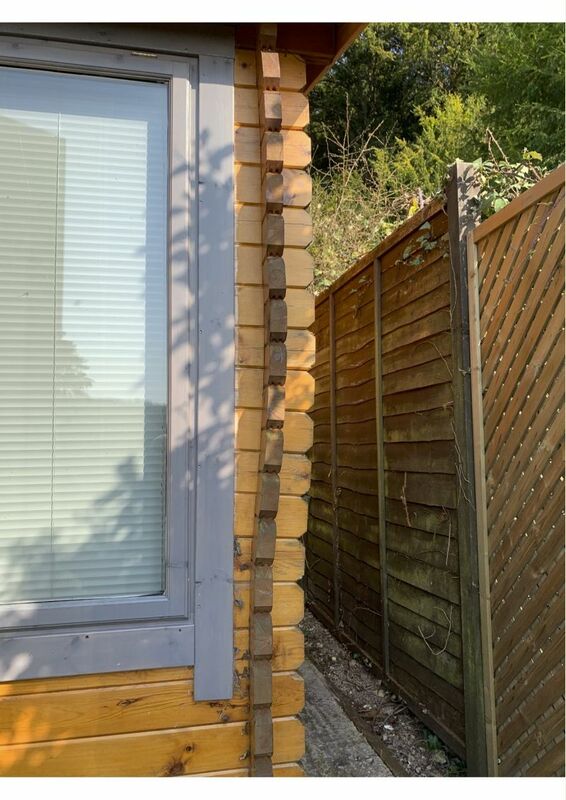 I really hope it's not the actual wall, as you can see from the picture that the logs near the top are completely outside the lower logs at the bottom. That would leave basically the window holding up that corner of the house. If it is just a cosmetic siding a few screws should refasten it into the vertical plane. That doesn't seem like a big deal then. The title of the topic does use the words "outer wall" so maybe that is correct. ??? But as Wilbour mentioned, he has a friend with a shed that has had the "logs" slide into a parallelogram shape. So who knows without more info from the OP. If you look at their sketches. Note how often the doors and windows are placed close to the edge of the structures. Thanks all - some great suggestions and I really appreciate your input. I will report back on my progress! What I can't tell from that is whether or not there is hidden reinforcing.